I hope to return to regular Sugar Free Sunday posts starting on October 3rd. Meanwhile, enjoy this yummy full-sugar, nothing-but-goodness cake! My husband has never been one for fancy decorated cakes--he always requests a home baked cake for his birthday, usually chocolate-on-chocolate. After eating more than his fair share of banana nut cake recently at the home of a family member, he surprised me by asking me to make one for his birthday this year. I called and asked for the recipe and made one for his birthday--and promptly turned around and made another the very next week! This is a wonderful, moist, cake, with just a hint of "real" banana taste--and the made-from-scratch cream cheese frosting makes it even better! Cream together butter and sugar; add eggs, vanilla, and sour cream, beating well after each addition. In a small bowl, stir together the flour, baking soda, and salt. Add the dry ingredients to the sugar-butter mixture, and mix--this will be very stiff--then add in the mashed banana. Add chopped nuts, and stir to incorporate. I baked this in a greased sheet cake pan, about 15 x 10, 20-25 minutes, at 350 degrees. Allow to cool, then frost with cream cheese frosting, below. 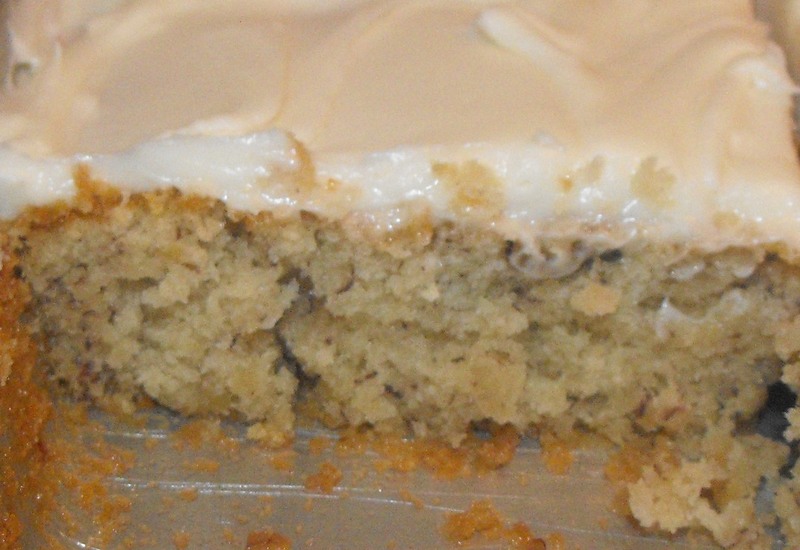 Make sure that the butter and cream cheese are well softened, then cream together with vanilla extract. Add the powdered sugar and mix well. This will be very stiff, especially at first. The first time I made this, I thought my mixer was going to bog down, so I added a dash of milk. It made the mixing easy, but the end result was soft--since I made a sheet cake, it still worked, but it would have been a little too soft to frost the sides of layer cake, for instance. The second time I made it, I just persevered with the mixer, lifting it from the mixture once of twice to clear the beaters, and it did all cream together to make a luscious, thick frosting. And left lots on the beaters to lick off afterward, too. All by myself. I'm not usually much of a "banana nut" gal myself--I didn't even taste this when we were visiting, and would have never picked this to try if my husband hadn't asked for it--but I'm so glad he did! This has no artificial pseudo-banana flavoring, just real bananas, and it has such a subtle flavor--this is a keeper, for me as well as the rest of the family. Until next time, good baking, and good eating! Just tell me one thing that ISN'T good with cream cheese frosting! :-) Thanks for sharing this delicious looking recipe. This looks so good, also. You have wonderful recipes. This was out of this world good! Since I'm trying to watch my weight, I cut out 1/4 cup of sugar and used light sour cream in the cake recipe instead. I also made only half of the frosting and didn't even use all of it to keep down the calories! This was sooooo good that I shared it with my neighbors so it won't be around for me to be tempted! Thanks for sharing!